So things have been awfully quiet here. I lost a post a did a while back due to a backup system that I hadn’t vetted. The short of it is, I went to ESXI, I cried, I came back to proxmox/kvm. There was quite a few potential posts that I could have done along the way, but I was more focused on getting my little world back up and running. So there’s the bad news, I went in circles for no reason. The good news is that I’m about to dive into AWS which could warrant a decent post or two, we’ll see how thats goes. Been on a bit of a personal struggle and an atypical existential crisis after moving into the new place, but it’s just more of a reason to get back to work than anything. All this is is the physical layout of my stuff. 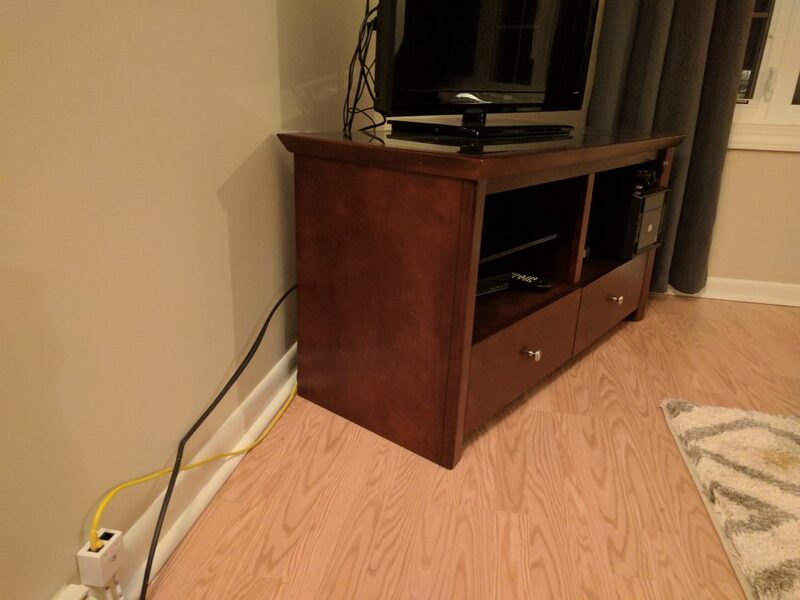 I’ve completed some more cabling at the new home as a one month anniversary so here’s an easy post with no real thought on my part. State of the rack, nothing really new here. Six of my drops go right to the office. 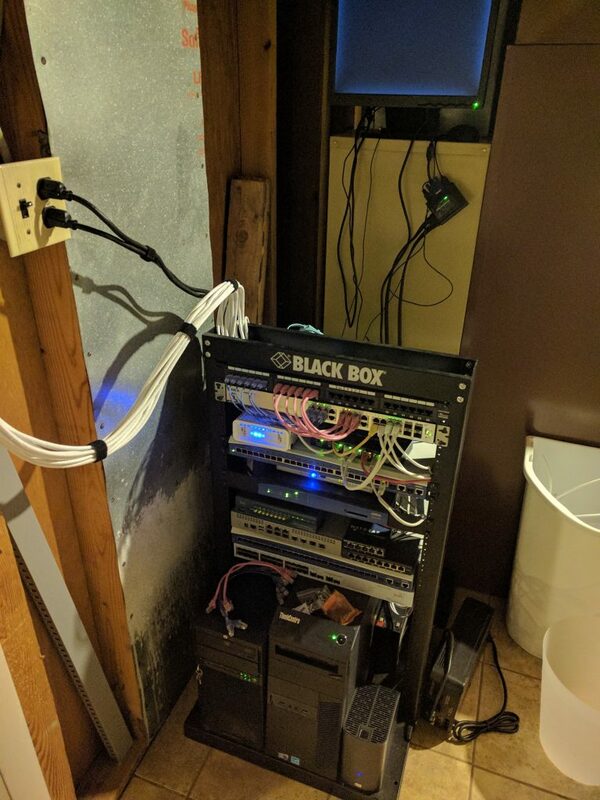 Enough for a couple computers, a phone or two, and a switch for labs. 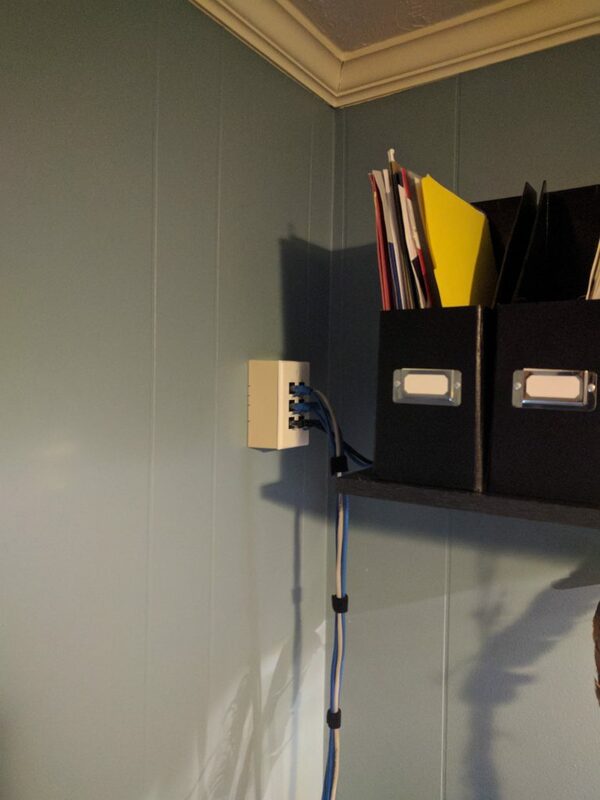 I went against the grain here and put the plate up high just because I didn’t want to have to crawl under a desk to plug and un-plug things. I don’t regret it at all. The office as a whole a pretty good upgrade. Plenty of room. 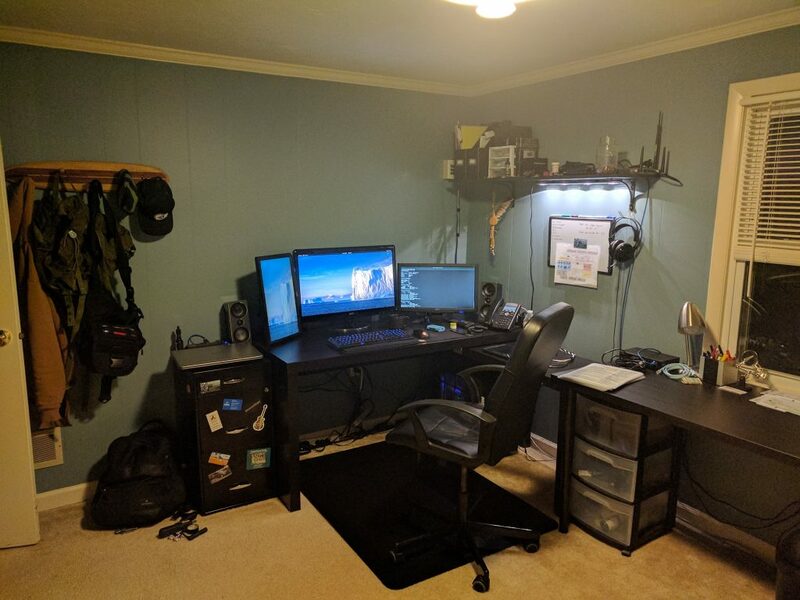 Behind me is another desk for the lady and her computer as well. This is really a lab bench. There’s a 16 port zyxel switch there with a trunk to all my vlans so I can work out whatever is needed. 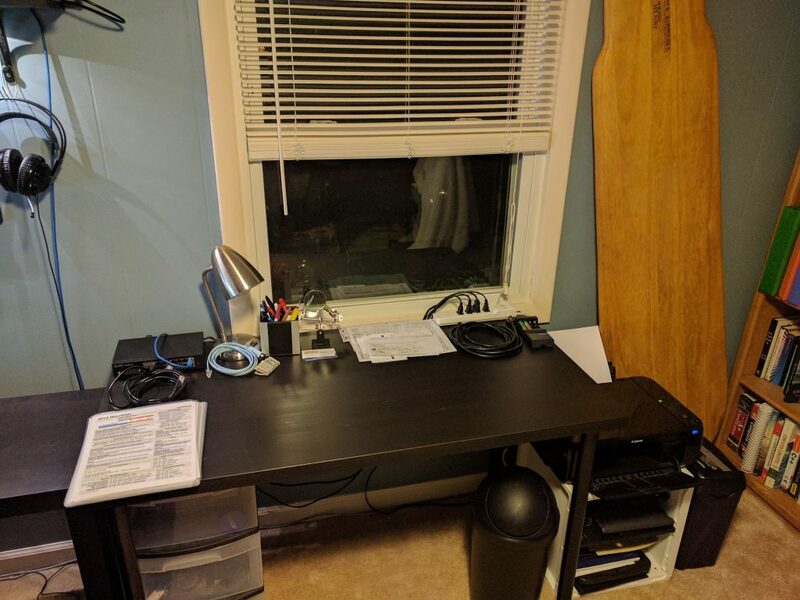 I really wanted this space for when I bring stuff home for prep/testing. There’s 2 drops at the TV. One going to the PC there, the other for future. I need another white patch cord. This is a zyxel nwa1123-ac. It really has been pretty great and I couldn’t be happier with it for the sub $100 AP range. 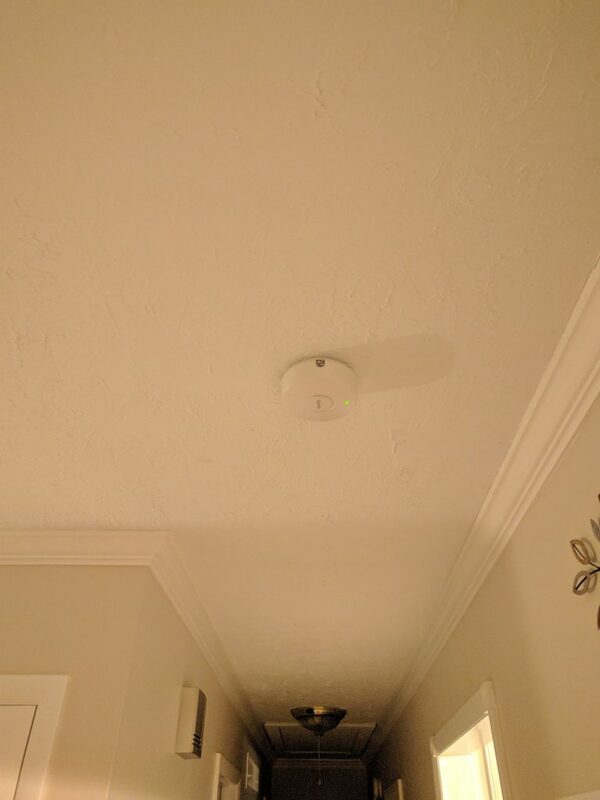 It’s AC, allows plenty of SSID’s, and plenty of features to boot. Really a bargain if you’re in the market imho. This is it’s new home now that I ran the cable. From here we have great coverage in the whole house, even downstairs in the 5ghz spectrum. 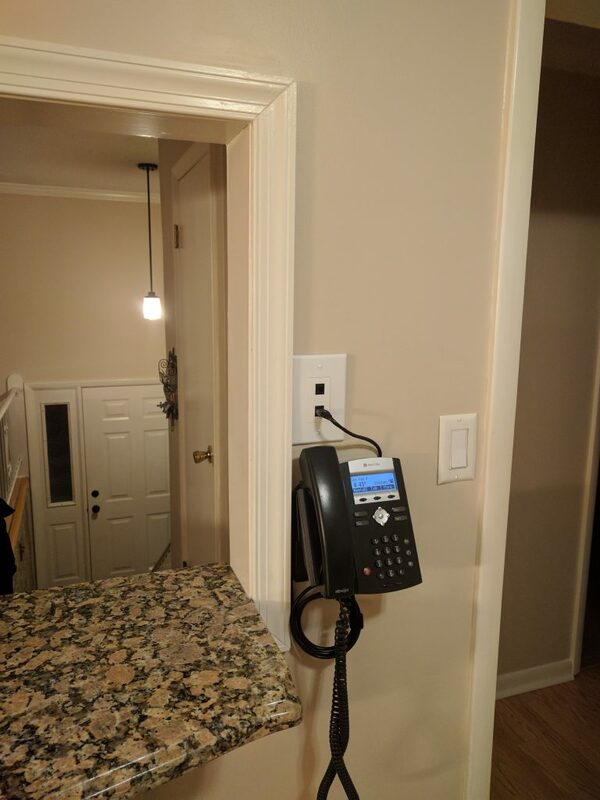 I convinced the boss to let me run a couple data to the kitchen, and mount a phone at that. There’s push to talk and paging setup so there should be plenty of fun, “make me a sandwich” talk in the future. I just had training with her today on how to use the PTT. The main purpose though is for when I’m on call. I can’t hear my phone if it’s charging down in the office, so I set our PBX up to try this phone as well so I don’t flake out on my colleagues. So coming up.. I’m hoping to set up a raspberry pi thermostat. I ran an extra cable just for it. AWS, that should be coming as well. I’ve been playing with containers but really, that’s a broken record that this point, it’s all the rage. I’m going to have to play this by ear, things have been a little crazy just trying to get settled with the new digs.